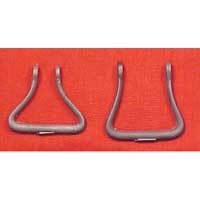 An investment cast steel sling swivel set suitable for many Jaegers, early PA and KY rifles, Fusils, Trade Guns, etc. Lower swivel designed to mount to trigger guard post, upper mounts to forearm. Takes a 1" sling. Steel only.